All types of motorcycles big or small require timely servicing. Some higher capacity motorcycles have service intervals which are not as frequent as of the small capacity bikes, but none the less, all bikes do have to go the service centers at least once a year. If you own a bike you already know the story that it is quite a pain to take your bike to the service center every six to eight months, but what if we tell you that motorcycle servicing is not as difficult as it may appear to be and you can easily do the same at home. There is a reason that not many service centers talk about motorcycle service tips in the open, and that is only because they make quite a decent money by covering the service touch points and keeping the details hidden. So in the article below we cover a number of points that will boost your confidence when it comes to servicing your motorcycle at home. Before the servicing, make sure you have your motorcycle service manual booklet handy. The reason why it is so important is because it has all the information in close details. The service book will guide you about all the tools that you may require for opening certain panels of your bike, also it has the details regarding the time of replacement of certain spare parts such as clutch plates, spark plugs, and most importantly the service intervals of your bike. It will inform you regarding the spare parts which need urgent replacement as per your current usage or distance reading on your odometer. For example, there is no need to change spark plugs or air filters during first 10,000 kms in most of the bikes but still service centers insist that you replace the same, why? No other reason apart from sheer profit and easy money. If your bike is under initial years of running, then the only parts that will need replacement is engine oil and oil filter. That aside, in the later years of running, parts like spark plugs, air filter, brake pads, chain set and clutch plates will need replacement. Once you’ve taken assistance of the service manual booklet, you will need the spare parts which can easily be bought via online stores or you can directly contact the service center to provide you the same. Make sure that you buy only those parts which are designed for your bike. For example there are a wide variety of engine oils present in the market today but only go for the specific oils which are recommended as your bike’s engine cubic capacity and design. 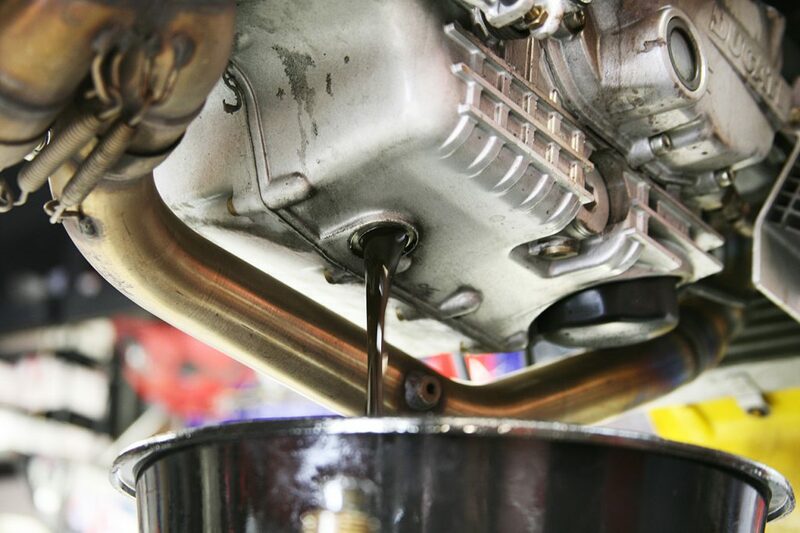 Using non recommended engine oil may alter your bike’s performance which can later on affect the engine life. 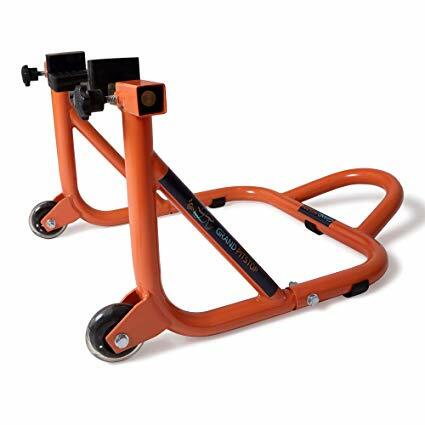 Apart from the spare parts you will also need a paddock stand on which your motorcycle will be parked while getting serviced. It is not advisable to park the bike on the side stand as it will restrict proper oil drainage from the engine and will only make the servicing procedure tricky. Buy paddock stands available at Grandpitstop.com! Once your motorcycle is set on the stand, allow the bike and the engine to cool down if you have just arrived from a ride. Let it cool down for at least 15 to 20 minutes as oil might still be hot from the run. 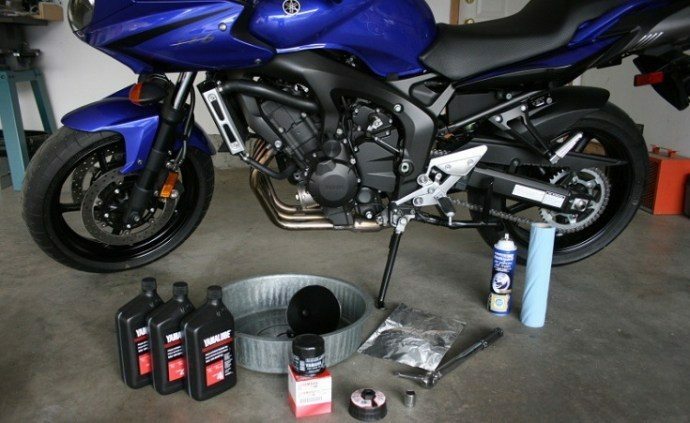 Once the bike is cooled down, start with draining out the oil in a pan. Allow the settled oil to drip out completely ensuring there is nothing more left in the engine chamber. At the same time, loosen the oil filter attached and discard it along with the drained oil. Please note, do not throw out the used oil down the basin of your bathroom as it is a serious health hazard, and hence follow proper recommended techniques to discard the used oil. Next step you need to follow is taking out the air filter of your bike which is usually located underneath the fuel tank. Clean it and shake off all the dust and dirt it has blocked from entering the engine chamber. If your air-filter is wash type, you can quickly rinse it in water to allow the dirt and muck to get loose and come off quickly, else if you use basic air-filter do not even think about putting it anywhere close to water. Once the filter is clean and dry, fit it back into its compartment and assemble back the panel. By this time the engine chamber is almost dry, now fit back the nut that was loosen for draining the oil. Once the nut is in the position, start pouring down fresh oil and fill exactly the quantity as per recommendation. Filling down more or less will only prove to be dangerous for the engine. At the same time, make the new oil filter wet by splashing some fresh engine oil on it and fit it inside its place in the engine compartment. By this time your engine oil and oil-filter is replaced, and you have cleaned your air-filter. Now take a quick look at the motorcycle chain if it is too untidy, or loose. Make sure you clean and lubricate the same. 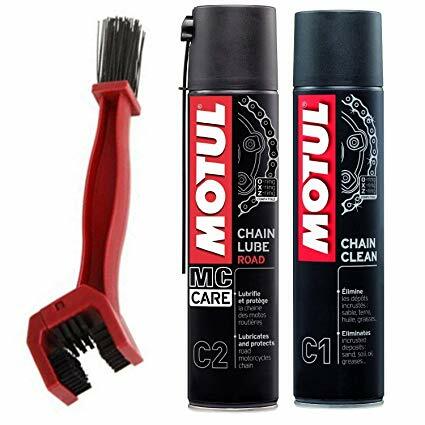 Use Motul Chain cleaner and lubricant spray available at Grandpitstop.com. Now basic maintenance of your motorcycle is done and it is good to cover another 4,000 to 5,000 kms on the road. It is always fun to learn how to service your own bike, also there is no harm if you can save some extra bucks in the process. Right? Stay tuned for more such updates! Motorcycle tyre maintenance: All you need to know!